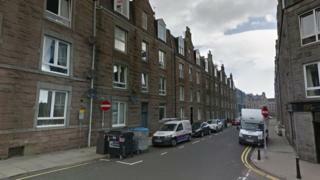 A police investigation has begun after a young woman was raped at a property in Aberdeen. Officers said the 23-year-old was the victim of a serious sexual assault in the city's Raeburn Place in the early hours of Saturday. The attack is believed to have happened between 03:15 and 04:15. The attacker is described as aged in his 20s, of medium build, about 5ft 8ins to 6ft tall, wearing a light blue T-shirt and dark blue jeans. Forensic teams were at the scene and officers were carrying out door-to-door inquiries. Det Insp Allen Shaw said: "We have received a report of a serious sexual assault which happened in the early hours of today within a building in the Raeburn Place area of Aberdeen.